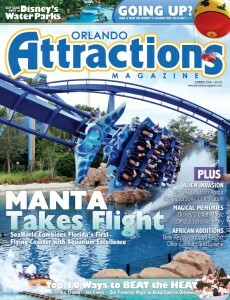 The Summer 2009 issue of Orlando Attractions Magazine is now available for preview and pre-order. It’s our first quarterly issue and the first of our new and improved editions featuring nearly 20% more pages, thicker paper, more high-quality photography, and more articles than ever before. with SeaWorld’s Manta, Florida’s First Flying Roller Coaster. Typhoon Lagoon and Blizzard Beach offer cool retreats year-round. Contest winner looks back at his year as Disney’s Chief Magic Official. Kidani Village expands upon the culture found at Disney’s Animal Kingdom Lodge. Disney’s newest restaurant dishes up African cuisine with Indian flavors. • Stitch invades Tomorrowland in Stitch’s SuperSonic Celebration. And if you subscribe now at our new low price of $19.99, you’ll be among the first to receive the new Summer 2009 issue when it begins to mail out next week. But hurry or you’ll miss it! Again, you can preview and pre-order the Summer 2009 issue here.